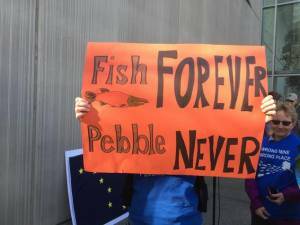 July 20, 2018 – A new poll found that an overwhelming majority of Bristol Bay residents continue to oppose the Pebble Mine and believe it poses a threat to the region’s commercial, sports, and subsistence fisheries. Salmon are the economic and cultural linchpin of the region, generating $1.5-billion annually, supporting 14,000 jobs, and providing the lifeblood of subsistence culture and a powerful economic engine for the entire region. The proposed Pebble Mine—a giant gold, copper, and molybdenum mine—would sit at the headwaters of Bristol Bay’s legendary salmon-producing rivers. The poll, commissioned by United Tribes of Bristol Bay and conducted by Hays Research Group last month around the start of the fishing season, surveyed residents of the Bristol Bay region. The results are not good news for Pebble or its embattled owner Northern Dynasty Minerals (aka The Pebble Partnership). The poll reveals that an overwhelming majority (80%) think that the Pebble Mine would pose a serious threat to fishing in Bristol Bay. A vast majority (77%) oppose the Pebble Mine. And a significant majority (70%) believe that the Pebble Mine and Bristol Bay salmon fishery cannot safely co-exist—debunking one of Northern Dynasty’s favorite talking points. This level of opposition is formidable and shows, once again, that Pebble will never obtain the social license needed to develop this toxic project. Northern Dynasty applied for permits last December, despite the lack of concrete plans, engineering review, environmental baseline data, and economic feasibility studies. The economic and tribal leaders of Bristol Bay—joined by Governor Bill Walker and Lieutenant Governor Byron Mallott – have asked the U.S. Army Corps of Engineers to pause the permitting process until Pebble supplies the missing information and can demonstrate that its project is economically viable. Yet the Army Corps continues to bulldoze ahead, seemingly oblivious to the astonishing deficiencies in Pebble’s application and the broad-based public demand for a stay of the process. Not surprisingly, trust in the Bristol Bay region isn’t running high right now. When asked whether the government will protect the watershed, the fish, and the economy in Bristol Bay, only 30% of participants said they trust the Army Corps’ permitting process to do so, 36% of participants said they trust the EPA under the current administration, and 43% said they trust Senator Lisa Murkowski. Put another way, the majority of participants do NOT trust the Army Corps, EPA or Senator Murkowski to protect Bristol Bay. In addition, Bristol Bay residents clearly are not buying what Pebble is trying to sell: 57% think Pebble’s “smaller” mine plan is just a foot in the door needed to fully develop all the resources at the Pebble deposit. And 70% of participants think that Pebble’s promise of “revenue sharing” is just an attempt to garner support from residents. 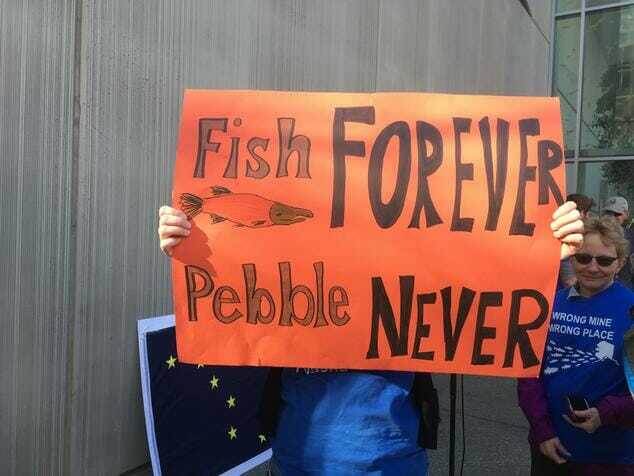 This is just the latest confirmation of the relentless and long-standing local opposition to the Pebble Mine. A 2011 survey released by the Bristol Bay Native Corporation (BBNC) found that 81% of its Native shareholders strongly oppose the Pebble Mine. In addition, 85% of commercial fishermen in Bristol Bay oppose Pebble Mine. The results of these polls leave no room for doubt: No Pebble Mine. Not now. Not ever.